Purple prunes made to look like golden pistoles, the old French coin ? They were the product of a subsistence economy. Until the 1900s, labour was cheap, but globalisation was already underway via exports of the sugary, sun-filled pistoles well beyond Alpine borders. It was an improbable marriage between an exotic foodstuff and an Alpine country with no colonies. But the entrepreneurial Swiss were globetrotters and had an abundance of good milk. The result was a revolution in chocolate-making during the 1800s, transforming cocoa beans into black gold and making Swiss chocolate a household name the world around. A delectable story. It was in town that they met and sugar went nuts. The great Dauphinois walnut, appreciated by confectioners and pastry makers in Switzerland as well, is a wonderful addition to any recipe. From the candied nuts so loved by Stendhal to a tremendous array of pies, candies and other delicacies. Energy bars are now the in thing among mountain climbers. Particularly because they were preceded by the horrible dried banana whose nickname serves as the title for this article. 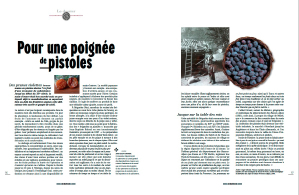 « But what ever happened to the good old days of fresh grapes with raspberry syrup and a bottle of champagne ? 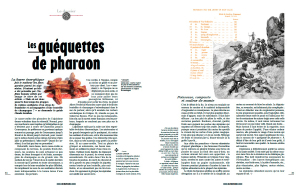 », wonders mountain guide Claude Gardien. These exotic words will have the Swiss salivating. 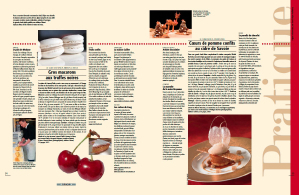 They are the names of just a few of the festive sweets served in the Fribourg, Vaud and Valais cantons. A rapid panorama of the delicious traditions that are part of the Swiss DNA. Monica Dalmasso has an unusual way of looking at the Alps. Just what we like at L’Alpe ! A delicate approach, a bit of insolence and rapid execution all make for a very personal touch. Enchanting. 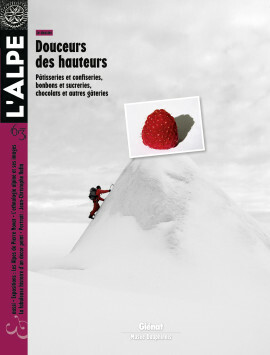 For this wintery yet festive issue, L’Alpe lists some of the best addresses for sugary treats throughout the Alps and presents four, very doable recipes drawn from the cookbooks of award-winning chefs published by Glénat. All Alpine skiers have, at least once in their life, held a panorama by Pierre Novat in their hands. Over a period of 35 years, the artiste drew more than 250 maps of ski runs for the main French ski resorts. An exhibit and a handsome book pay tribute to the virtuoso of the pen and airbrush. Excerpts. The Valais canton is to the Swiss Alps what the Queyras is to the French Alps, i.e. the preferred setting for folklorists and ethnologists, the stock of items for ethnological museums (and for collectors), but also the source of inspiration for popular images and scenes of Alpine communities. Jean-Christophe Rufin, writer, diplomat, world traveller and member of the French Academy, has close ties with the mountains. It is in his home in Savoy, far from the glitter and the receptions, that he writes his books. His words take the high road along the crests and his writing draws its energy from the tingling altitudes. From Grenoble to Asia, via Paris and New York ! 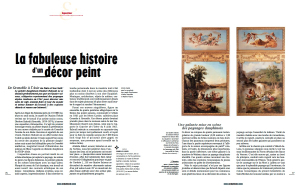 Diodore Rahoult, a painter from the Dauphinois region, would never have guessed that his Four Seasons paintings, allegories representing Alpine landscapes painted in 1861 to decorate the walls of a café, were going to travel the world and even create work for Chinese and Russian copyists on the internet !